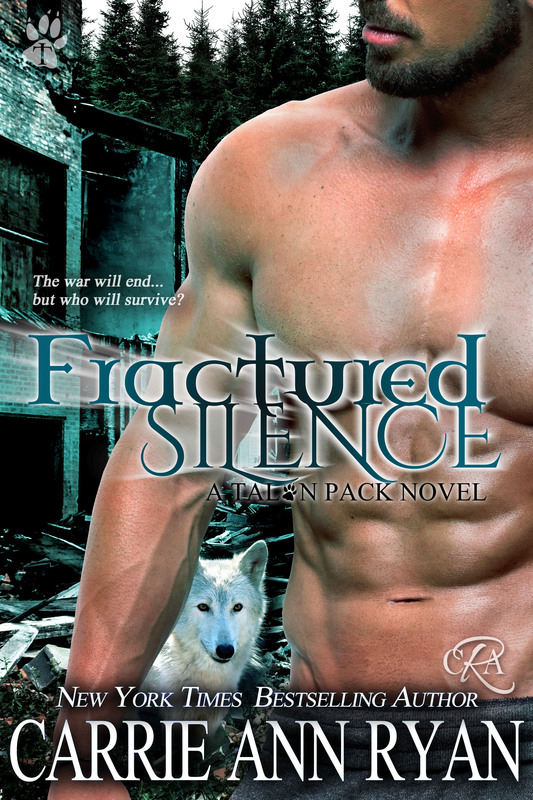 Chapter Reveal for FRACTURED SILENCE! Hi there! Today I’m sharing a chapter reveal for a new contemporary paranormal romance from Carrie Ann Ryan. 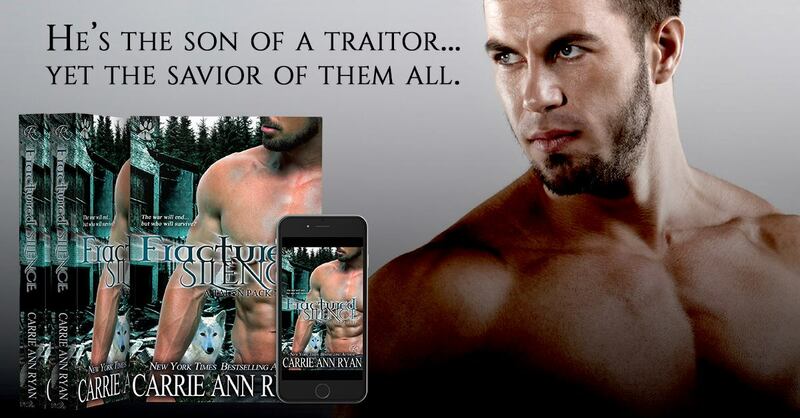 FRACTURED SILENCE is the fifth book in her Talon Pack series and features a menage relationship between two shifters and the human woman they share. It releases next week, so expect my review then. You can read Chapter One of Fractured Silence NOW! Parker Jamenson woke with a start as someone knocked on the door to the small cabin he’d been staying in for the duration of his visit to this particular European Pack. Using his wolf’s senses, he inhaled deeply, noting that the person on the other side of the door was one of the younger wolves that had shown him around when he’d first gotten there. He hadn’t met most of the Pack, as the people of the den hadn’t been too keen on his presence. He’d only just fallen asleep in the armchair fully clothed, exhausted from the trip. He’d already spoken to the Alpha about coming together with the Redwoods in times of war, but the damn man hadn’t been too eager to reveal his existence to the world. All Alphas were required to meet with Parker as the Voice of the Wolves because he was goddess-touched, but that didn’t mean they had to listen. Hell, most of them would rather bury their heads in the sand and ignore what was going on around them. And while his own Pack might be older than most in the United States, the European Packs were ancient and set in their ways. No one wanted to deal with the fact that the humans were aware of the shifters’ existence, but Parker knew that soon, no one would have a choice. She smiled coyly at him before licking her lips. He could scent her wolf brushing up against her skin, wanting touch, but Parker wasn’t interested. He just wanted to get this meeting with the elders over with and head back home. Her long, honey-colored hair had been in a braid when he’d first met her, but now it looked as if she’d brushed it out over her shoulders and back so it cascaded over her curves. She’d also put on a long, white, flowing dress instead of the tan one she’d worn when he’d shown up. And though she looked to be his same age and her power felt even younger, she dressed as if she were some maiden from a bygone era on the hunt for a knight. Parker would not be that knight— no matter how much those eyes of hers flashed yearning. He held back a chuckle that wanted to spill out since that would have been rude. She wasn’t hiding anything she wanted, and while he might have appreciated that on another day, he just wanted to go home. Besides, his wolf wasn’t interested in the woman in front of him, and while that might not matter for a quick night of heat, he didn’t have it in him to ignore his wolf tonight. Maybe I’m getting older, and in need of a mate, he thought. Or maybe he was just tired and missed his family. Either way, Tatiana wasn’t for him. “I’m afraid I will have to get ready to head out after the elder circle.” He held back a frown at the crestfallen look on her face. They hadn’t said more than a few words before this, and though he was a new wolf to her, he wasn’t the only healthy adult male wolf around. “I understand,” she said softly. “Follow me, then.” She turned without another word, but he didn’t miss the extra sway to her hips— an invitation if he were to change his mind. Keeping his thoughts to himself so he wouldn’t inadvertently hurt her again if he were to change his mind— which he wouldn’t— he followed her through the winding, dirt paths of the den toward the oldest part at the edge of the center. It made sense that this was where the elders chose to live— just slightly outside the most used part of the den for privacy but not near the edge in case of an attack. As elders, they were to not only be respected but also protected. Tatiana left Parker with a nod, and he bent to walk under a low-lying branch so he could make it to the elder’s circle. Encircling the firepit were seven older wolves of various sizes— three women and four men. At his entry, they all looked up as a unit and stared at him. If he hadn’t seen his own elders do this before, he would have been creeped out. Elder wolves were those who had either lost their mates long ago or had never been mated, so they didn’t have a connection to the new world or the Pack except through their bonds to the Alpha and those in the hierarchy. After living for centuries, some wolves could no longer deal with the drastic changes of society and chose to cloister themselves. Many of the wolves held immense power on their own because of their age and used that strength to protect the Pack in any way they could. Parker looked back at the elders respectfully. Though each of the wolves had at least two centuries on him, none of them looked a day over thirty-five. Wolf genetics never ceased to amaze him and he’d been born a wolf. She smiled softly at his words and gestured for him to sit down before introducing him to the others. He kept their names in the back of his mind, but he knew that it was Aurora who led here, and she would be the one to speak. Parker’s eyes widened. “The Redwoods?” How did something of theirs find its way here? Parker froze. Not many people knew that his family came from that line. In fact, he’d only recently learned that his ancestor was the first human to be made into a wolf by the moon goddess as a punishment for what the man had done to defenseless prey. She’d forced the man to become the thing he killed for sport, compelled him to share a soul with that of a wolf. From there, new wolves were made, and shifters were born. His uncle, Logan, had dealt with horrible side effects from that past, but other than his strength, Parker hadn’t really thought about what that meant. Logan had been far too aggressive even at a young age, and it had taken him years to learn how to fully control his wolf. He, like Parker, had also had to learn how to use their strength wisely when they’d been mere pups and still had to deal with some bursts of overextension some days. The family bloodline was diluted over time, and Parker had had more recent issues with it thanks to his birth father. His mother might be of the line of their honorable ancestors and campfire stories, but his birth father had been one of nightmares. He’d never truly met the man as he’d been young when Corbin died, but he knew the stories. Knew that the former Central Alpha had killed countless in his quest for power. He pushed that thought out of his head, as he knew just letting it in would enrage him. “I’m of that line, yes,” he answered after a moment. No need to lie as he had a feeling these wolves knew far more than this. “What did you find?” he asked. Aurora nodded at one of the male wolves after Parker had spoken. The male stood up with shaky hands, a large box wrapped in cloth clasped between them. Though his wolf had stood at attention as soon as they’d mentioned the box, it wasn’t until Aurora unwrapped it— keeping her hands on the cloth rather than the wood— that his wolf howled. “There is a prophecy,” she said after a moment. He blinked. “A prophecy?” Why did he feel like he’d suddenly jumped into an old Indiana Jones movie? Aurora’s eyes unfocused as she spoke in a deeper voice. “A wolf of three Packs can break their will or unite them all. Parker’s wolf rushed to the surface at her words, and he tried to blink, attempted to reach out and catch the woman as she fell forward after she’d finished speaking. Only he felt as if he were moving slower than usual, his mind not quite where it should be. His hand brushed the top of the box, and it slid to the ground, opening on impact. He looked down, his head going fuzzy, his mouth dry. An ancient dagger, or perhaps the tip of a spear, rolled out of the box amidst a dust cloud that slapped at his face. “The weapon of the first hunter,” Aurora croaked before passing out completely. The others surrounded them, yet he could do nothing but try to keep himself upright. Parker tried to speak but couldn’t force his mouth to work. Instead, his body broke out in a cold sweat, and he fell face-first to the ground. The last thing he thought about before passing out was his family. They weren’t here to help him. No one was here to help him. Interested? You can find FRACTURED SILENCE on Goodreads, and pre-order it in advance of it’s April 18th release on Amazon, iBooks, Barnes & Noble, Kobo, and Google Play.